You can download the themes from your FancyThemes account (fancythemes.com/dashboard). 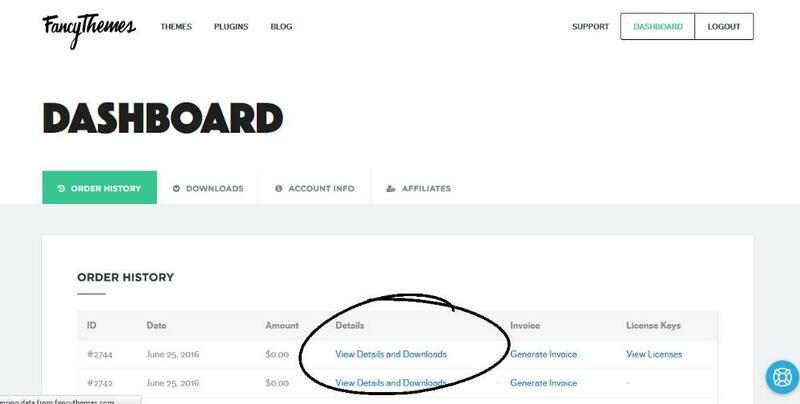 If you have purchased the theme from ThemeForest, then login to your account on ThemeForest > go to downloads page > download the installable theme files (& not the whole package). See the screenshot below. If you have purchased the theme from ThemeForest, make sure you only download the installable files and not the whole package. Login to your WordPress dashboard > Appearance > Themes > and Click the "Add New" button. Next click on "Upload theme" button, from top of the page. Click on "Choose a file", upload the theme, and click on the "install now" button. Once the theme is installed, click the activate theme button. FTP: To upload the theme via FTP, first extract the theme file zipped file. Then login to FTP (here are some great tools) and upload the extracted folder to "wp-contents/themes" folder on your server. Don't forget to activate the theme from your WordPress dashboard > Appearance > Themes tab. To fully enjoy the experience, you need to install the required plugins. Each theme may have different required plugins. For example, our founder theme require founder plus plugin which adds the Testimonials & Social media buttons functionality.